Seems simple enough, right? Just leave it behind. For the last four months I have left a very significant part of a woman’s wardrobe behind. Something most of us gals would not leave home without. Something we hate to shop for but typically agree is needed. Something we usually can’t wait to get off but always put on first. For the last four months I’ve had to part with this baby…the almighty BRA. Yes, that’s right! (My daughter is dying that I would share such news!) I’m not trying to prove any point or make a statement, trust me! This was out of necessity. This was my attempt to alleviate pain. And when Suzie said today’s topic would be “leave it behind” I immediately thought of my bra. After suffering with shoulder pain for a few days it was the first thing to go. And now four months later, even though I have tried, it has not returned. In fact the few times I’ve tried to return to my friend, the bra, I’ve had to depart from it again. I’m not sure what any of the ladies in the women’s restroom must of thought when they, if they, saw it drop to the floor as I tried to maneuver free from this constricting piece of clothing the other day when I decided I couldn’t take it anymore! And I’m so glad that someone invented camisoles and that big scarfs are in fashion, because they are my new best friends! But all this time I knew that I would be able to learn from this experience. We can learn from all experiences, right? I’ve learned that life doesn’t stop when you have to change your clothing selections and you are limited to what blouse you wear based on the color of the camisole that is clean. I’ve learned to laugh at myself. I’ve learned that the things we think we must do can be modified and we will still be able to press forward when we otherwise feel we would be left behind. I could hide out at home. I could. Instead, I’ll throw on my scarf and keep teaching bible studies! I keep teaching Faithfully Fit workout classes and ask for help when needed. And girls, if you are still reading and you wondered if I would ever get around to Jesus…I’m here! He’s here! He’s walking me through this painful ordeal and I trust that on the other side of this are great things that He is working together! Yes, I’ve learned to trust. I’ve learned to be more patient (notice I said more, I’m still working on this attribute). I’ve learned that often we must left go of things that create pain and leave them behind. What I have left is simple, but I think it can be applied to tougher choices. Abusive relationships, self-destructive habits. When something is directly causing pain, we must leave it behind and trust God to take us through to something new. There are times of pain we can walk out of and it is for our healing. And humility and compassion. Yes, they top the list. I’ve learned to not take myself so seriously and to have compassion for those who live with pain daily. Yep. And they are important wardrobe essentials! 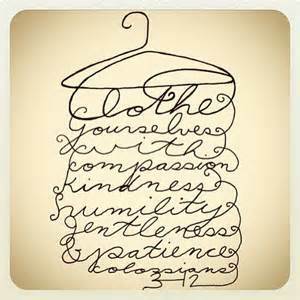 It’s part of God’s accessory list for us found in Colossians! And so is patience! So, yes. I’ve left the almighty bra behind. And it’s ok. I’m still a girl. A beautiful girl. Chosen. Dearly loved. And if you see me with a big scarf on…now yall’ know why! Standing firm, cause we may need to leave things behind, but Jesus is always there! Jodie you are so brave!! To throw it off AND to write about it! I am so glad you have found some relief from the pain. Praise the Lord! Suzie, You said we could be humorous! And certainly when there is pain we need laughter. But in all seriousness, I know that He is with us all and uses each trail in our life for teaching and for good. 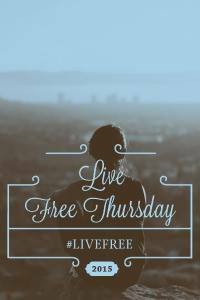 I’m thankful for all the girls who will link with you today because I know we will all learn so much about living free! Jodie, I was grinning as I read your blog. I have chronic pain and my bra has been gone for years. I use ribbed women tshirts or summer tank tops are both thicker then camisoles but comfortable under my shirts. I wear scarves of all texture, colors and sizes for neck pain year round. I love how you linked Christ through throwing off and putting on. I needed this today. Love from another no bra Sister!